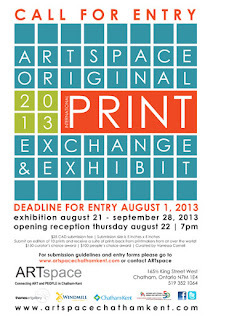 ARTspace is eager to announce a Call for Entry into the second bi-annual International Print Exchange and Community Arts Initiative, which will run from August 21 – September 28, 2013. An open call has been put out to artists, print studios and forums across the globe asking printmakers to create a print with a paper size no larger than 5 inches x 5 inches (12.7cm x 12.7cm) and an image size no larger than 4 inches by 4 inches (10.7cm x 10.7cm) in an edition of ten. Each artist will have one of their prints on display and for sale at the standard price of $75.00 + HST while the rest of the prints will be distributed among other participants, ensuring each artist will receive a suite of different prints. These prints will be on display on ARTspace with an opening reception that will take place on Thursday, August 22, 2013 at 7pm. During the opening reception, a curator’s choice award of $150 and one people’s choice award of $100 will be selected. 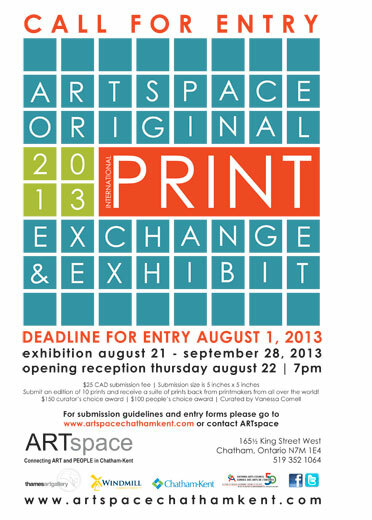 Please note: the deadline for entry is August 1, 2013. For Chatham-Kent artists who wish to participate, ARTspace will conduct a series of print workshops and open studios at the Thames Art Gallery. Please contact ARTspace for details and dates of the workshops.